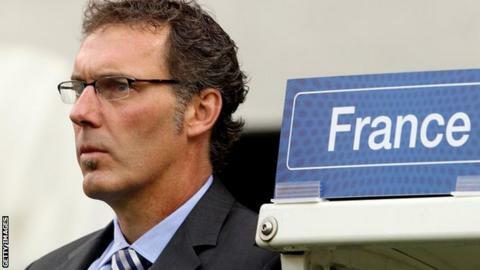 France coach Laurent Blanc expects a physical challenge when his side come up against England on Monday. England go into the match without Wayne Rooney, Frank Lampard, Gary Cahill and Gareth Barry but Blanc believes Roy Hodgson's men will be tough opposition. Blanc said: "They are not at full strength but what concerns me is that England will play in a certain style. "We are going to have to be extremely strong physically. That is going to be a difficult match." England's preparations for the tournament have been hampered by suspension and injury, while Blanc's France are unbeaten in their last 22 matches. But Blanc - who had a spell as a player in England with Manchester United - expects the rivalry between the two nations to give England an edge. "England will give everything because, when there are French against English, it raises the game above the normal international match," he said. "But we don't fear them more than other teams." Bayern Munich winger Franck Ribery and Real Madrid striker Karim Benzema have been in sparkling form in France's warm-up games, but Blanc admits that he has some reservations over his team's defence. He said: "Fundamentally we always knew that we had a quality attack. "In the last three games Ribery has rediscovered his club form at this level. "With Karim Benzema, who has carried on his excellent form for Real Madrid, that makes two hugely talented players. "In qualifying we relied on a good defence, I hope that we can rediscover this level of performance in defence."